In a large pot over medium heat, whisk together 1/4 cup sugar, milk and cream until the sugar dissolves and the mixture almost boils, about 2-3 minutes. Meanwhile, whisk together 1/4 cup sugar, salt and the egg yolks until it forms a ribbon and is yellow and creamy, about 2 minutes. Add about a 1/2 cup of the cream mixture into the eggs and whisk to combine. Pour the egg/cream mixture it into the cream mixture on the stove. Whisk in cocoa and cook, stirring occasionally, for about 8 minutes or until the mixture coats the back of a spoon. Remove from heat and whisk in the chopped chocolate. Strain mixture into a bowl. Stir in the nibs. Allow to cool on the counter then cover and place in the refrigerator to cool completely then pour into a ice cream maker and churn until cold and set. Place in a freeze-safe container and freeze until solid. Note: I used Askinosie single origin organic bars, cocoa and nibs for this recipe. I highly recommend them. I've become nibs obsessed. Who wouldn't like tiny bits of crunchy chocolate? I've been hard at work trying to come up with new recipes that showcase them. I was thinking about making coffee-nib ice cream after I got some yummy coffee from Swing's Coffee but I also had some cocoa powder and bars that I wanted to try so I went the chocolate-chocolate-chocolate route. I did a little experimenting and ended up with what I think is one of the best ice creams I've ever had. 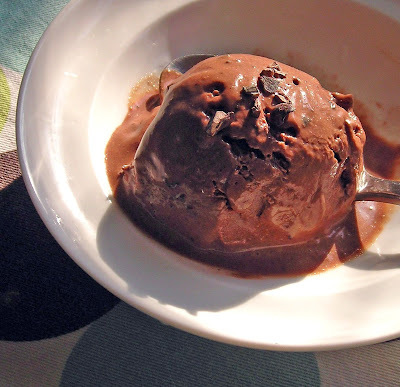 It is intensely chocolate with bits of nibs that aren't jarringly crunchy (thanks to the chilling process) and a rich, creamy texture. Perfection!